Pickman vase - 6⅞" (174 mm) high. At the beginning of Queen Victoria's reign Charles Pickman, a Liverpool industrialist, went to Spain and built a ceramics factory on the site of the disused Monastery of Santa Maria de las Cuevas at Cartuja near Seville. 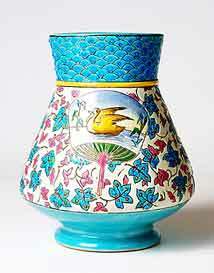 The company was known as La Cartuja Pottery. By the middle of the 19th century Seville was connected to Cadiz and Cordoba by rail, and Pickman was able to export his decorative pottery world wide. The pottery continued in operation until 1982 when the company moved to a new out-of-town plant. The new factory is open to visitors and tours of the plant are popular. The original site was restored in 1992 as the 'Royal Pavilion' for Expo 92, and is now the headquarters of Andalusian Heritage Institute.